GIRL FLU is the story of Bird‘s worst week of her life. It begins with her getting her first period and then slowly slides off the table as complications with her mom, her friends and life in general pile up. Sweet and ultimately charming look at a key week in the life a 12 year old young woman with way too much on her plate. Wonderfully acted by a sterling cast the film handily wins us over. 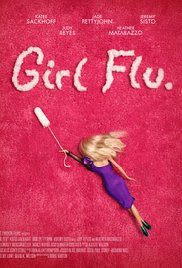 Despite being about subjects that are normally raucous gross out jokes in other films, GIRL FLU makes it clear that there is lots of material to be mined both dramatic and comedic in one of life’s misunderstood moments. As charming as the film is there are problems. Most of them coming from a tendency not to trust the audience and drift into shtick. Bird having tampons and pads explained to her by her mother’s friend is very funny, probably close to some people’s reality, but at the same time is framed as being a tad too silly. Other complications are their more of comic effect or an easy pull of the heart strings and while we react as the director intended the easy path slightly diminishes what should be a near perfect film. Minor problems aside this is a winning film that is wonderfully unique and its own thing. Even better its good time with good people who will make you feel good.